Previously Undiscovered Folk Art Painting Brings $252,000 at Auction | Skinner Inc.
I’ve been an appraiser on Antiques Roadshow since the very first episode in Concord, Massachusetts eighteen years ago. Now, the Emmy® Award nominated show attracts thousands of people to events in cities around the country. I love meeting these people and seeing what keepsakes they treasure. Some of the items have only sentimental value, but occasionally I find items of real aesthetic or historic value. These are the special objects that have inspired many to take another look at things tucked away in attics and basements. I’m always happy to inform someone about the value of his or her family heirlooms. But on rare occasion, years or even decades later, I may hear from someone I met on Antiques Roadshow who is now interested in selling at auction. At a recent American Furniture & Decorative Arts auction, a Sturtevant J. Hamblen painting soared past its estimates to sell for $252,000. The wonderful naïve portrait came to Skinner by virtue of my long involvement with Antiques Roadshow. 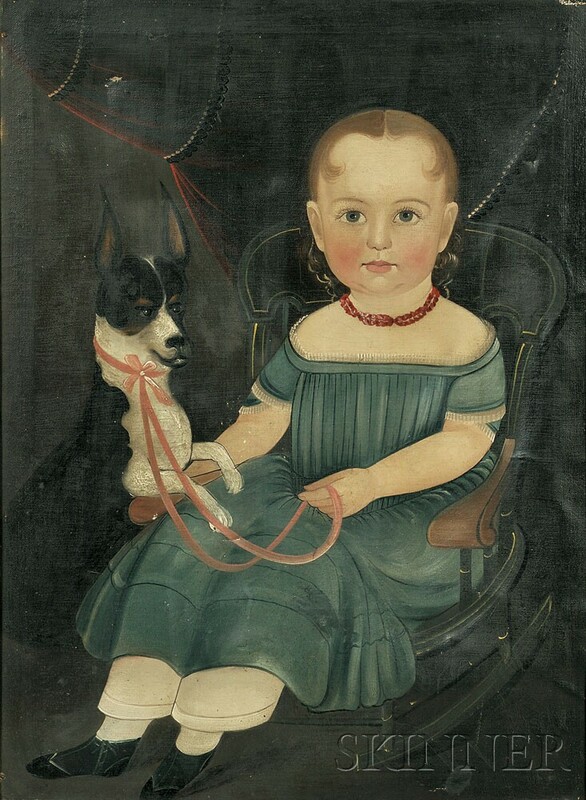 In the picture, a little girl sits in a Boston rocker. A black and white dog with a pink leash has its paws on her lap. The woman who owned it had passed away with no living relatives, and the appraiser handling her estate discovered a note attached to the back of the painting. It had my name on it, and mentioned a painting of a boy from the early 18th century that I had appraised on Antiques Roadshow in 2006 for $30,000-$50,000. I can only guess that the woman must have watched my appraisal on television, and thought her painting was somewhat similar to the one on the show. In this case, her painting was actually from the 1860s, not the 18th century, and the painting techniques of the two works are quite different. However, in a happy coincidence, I estimated the value of the painting of the girl as $30,000-$50,000 – the same estimate as the painting of the boy! In many instances, values of antiques or folk art may fall after a decade. But the market for extraordinary works has remained vibrant and competitive. This painting has that rare combination of elements that put it into the category of 19th century naïve portraiture at its best. Sturtevant J. Hamblen (alternatively “Hamblin”) lived and worked in the Portland, ME area where his family owned a house, sign, and ornamental painting business. “His talent reveals itself in fresh, immaculate, and clearly conceived likenesses with considerable decorative appeal,” states the book American Folk Portraits, edited by Beatrix T. Rumsford. The work Skinner sold had previously been unknown to the collecting world. It still had its original frame and had never been cleaned. Discovering a painting of this quality in such untouched condition is a very rare occurrence, and we weren’t surprised when heated bidding brought the final price for the painting up to $252,000. I look forward to seeing many more pieces like this one on future episodes of Antiques Roadshow. I hope you’ll be watching! This entry was posted in Blog and tagged american antiques, Americana, antiques appraiser, antiques roadshow, Auction Highlights, folk art, folk art appraisal, folk art auction, folk painting, folk portrait, Get Inspired, naive art, portrait painting, Stephen Fletcher, Sturtevant Hamblen, Sturtevant Hamblin, television appraisal, television show by Stephen Fletcher. Bookmark the permalink.